On Thursday, June 20—shortly before noon—a landmark on the campus of Freeman Academy came crashing down. The old Freeman Junior College girls dormitory, built in 1915 and today simply a run-down old house, was removed by Knodel Contractors. The structure, dubbed “The Cottage” and later the “Gateway Dorm,” accommodated the need for student housing at the college in the first part of the century. In 1965, Frontier Hall was built and the old dorm was then used for faculty housing. 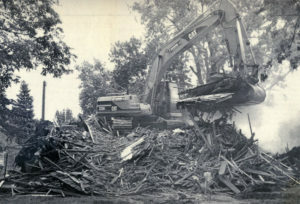 In 1973 it was remodeled and re-named the “President’s House” and became the home of Freeman Junior College President Bernie Wiebe and his family. In the 1980s, the building served as a dorm for Freeman Academy, which saw an influx of foreign students that decade. It was last known as the “Campus House” in the 1990s as it housed several faculty members. It has been empty the past few years. Freeman Academy President Marlan Kaufman said there are no immediate plans for the now vacant ground.